New-Suggestion Sketch for Dufferin Grove Park playground. Access from rink house to Playground: Accessible, will improve with paving of main Gladstone path. Access in playground: will be more difficult if new soft/deep sand were to replace existing gravel sand. Although rubber surface would increase accessibility, it's too expensive. 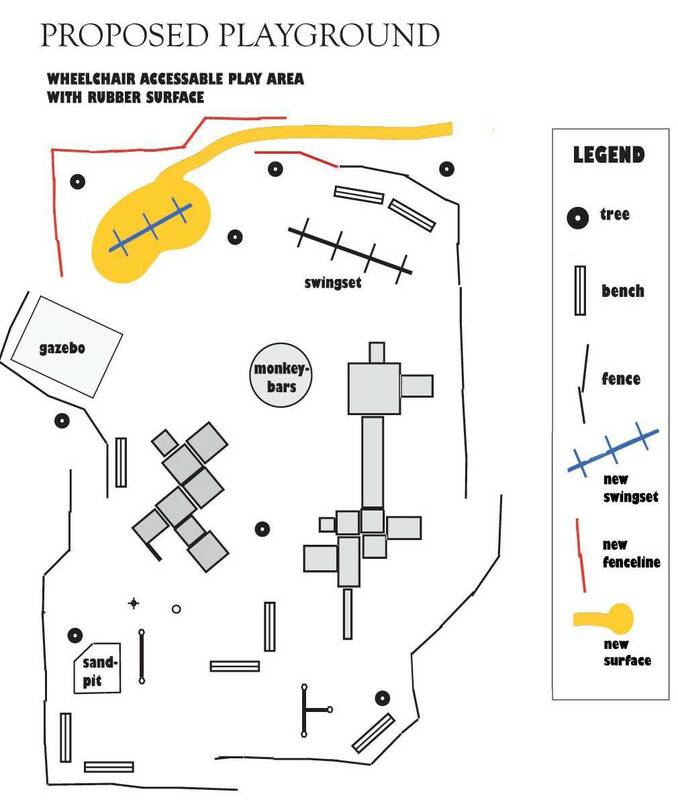 Perhaps only in accessible play area. Current swings are not appropriate, the small ones are too awkward for a five-year-old and the large ones have no support. Step-like stairs on play structures are great, rungs or ladder-type stairs are difficult. Ramps are great to lead up to slide and back down from slide so that wheel chair can go up and down. We need a ramp to the rain shelter.